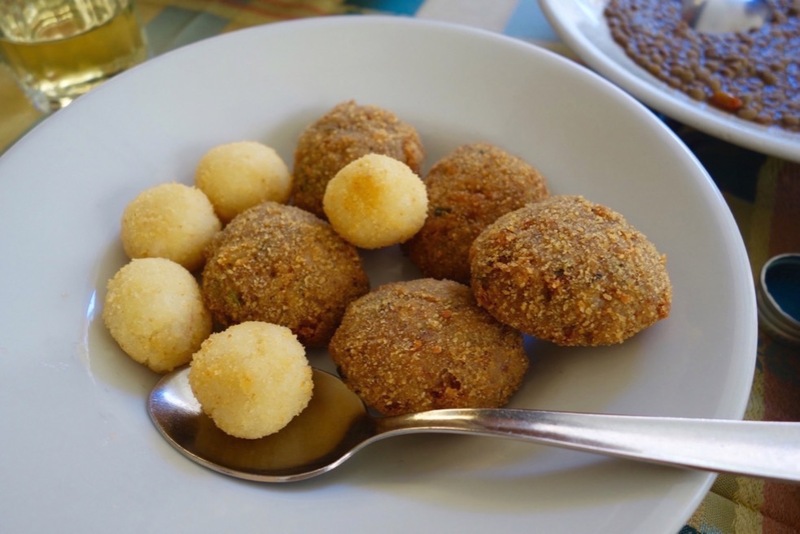 Whether it is your first, second, or tenth time in Italy, it is an absolute offense not to do a food tour (or food trip) when you are in the country. 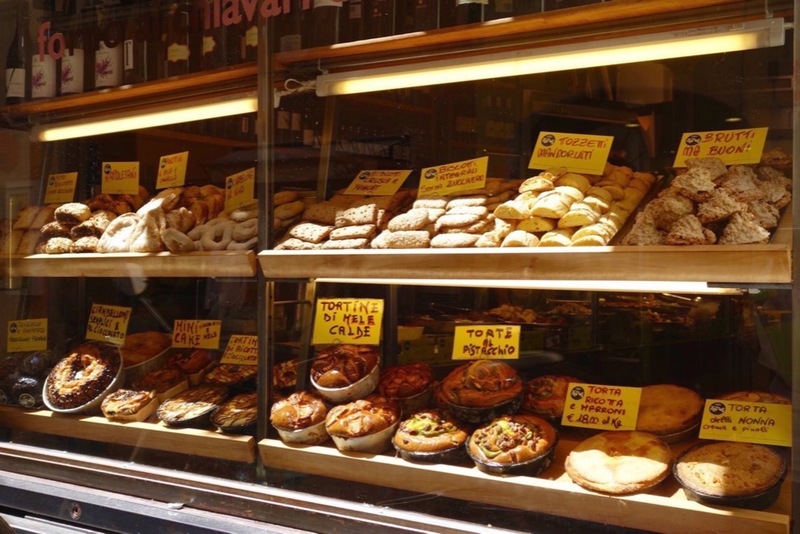 A food tour in Rome will not only fill your apetite but also your senses. A very wise person once said that “cooking and eating in a foreign country may be the surest, truest way to its soul”. And this is very true. When you dissect the eating habits of a country, you can tell a lot about the heart of its people. Rome was the embarkation and arrival port of the Mediterranean Cruise I joined with Celebrity. I only had half a day in Rome before the cruise departed so I decided to spend more time in Rome on the ship’s return. And by more time I mean having one full day. But that’s more than enough for me to savour a Fresh Market Lunch Tour with The Roman Guy. And who is this “Roman Guy” you ask? No, it’s not an elusive name for a mysterious companion. The Roman Guy is a tour company that specialises in taking your enjoyment in Italy very, very seriously. They focus on small, intimate tours to ensure that your experience in Italy is unforgettable. On some cities, I don’t mind the conventional group tour. But not in Rome. Rome in itself is already a popular city for tourists, anytime of the year. The best thing you can do for yourself is to make these experiences as unique and as intimate as possible. I obediently arrived not full (with a granola bar in my bag just in case). By the end of the tour I wish I had arrived with more room in my stomach, and I never needed that granola bar after all. 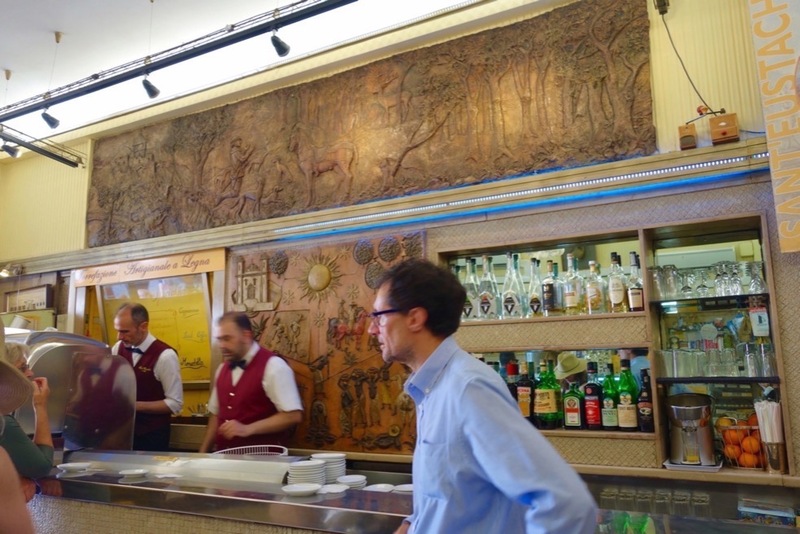 Our meeting point was at Caffe Sant Eustachio, near the Pantheon. Here we met our guide, Rachele. Rachele is originally from the USA and followed her roots to Italy, speaks Italian like a local and is very passionate about food. The Roman Guy wasn’t kidding when they said “it will be a small tour group”. There were just 3 of us- My cousin, myself and a lady from Wisconsin. We also had the lovely Lorna from The Roman Guy accompanying us, and a group of 5 ladies doing a walking food tour in Rome was just the perfect number to make it feel like you’re exploring Rome with friends (and not on a tour). 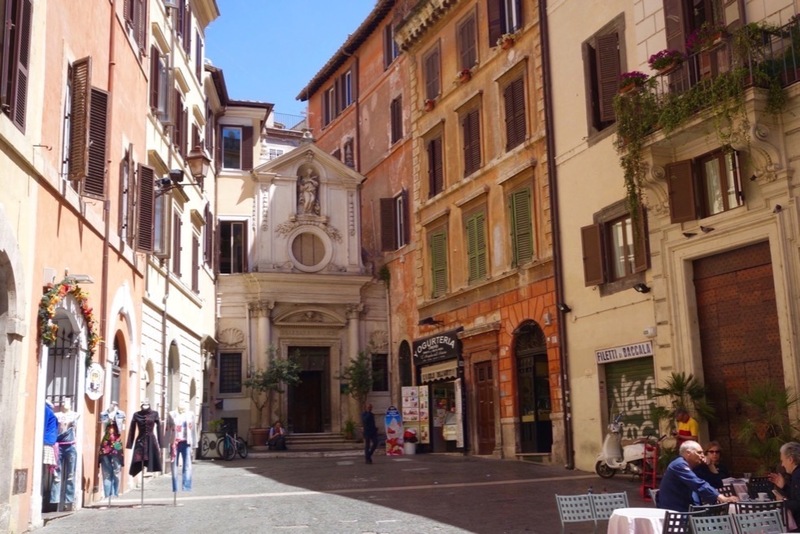 If you are passionate about coffee or are from Rome, you would probably know about Cafe Sant Eustachio, a popular cafe for both locals and tourists. 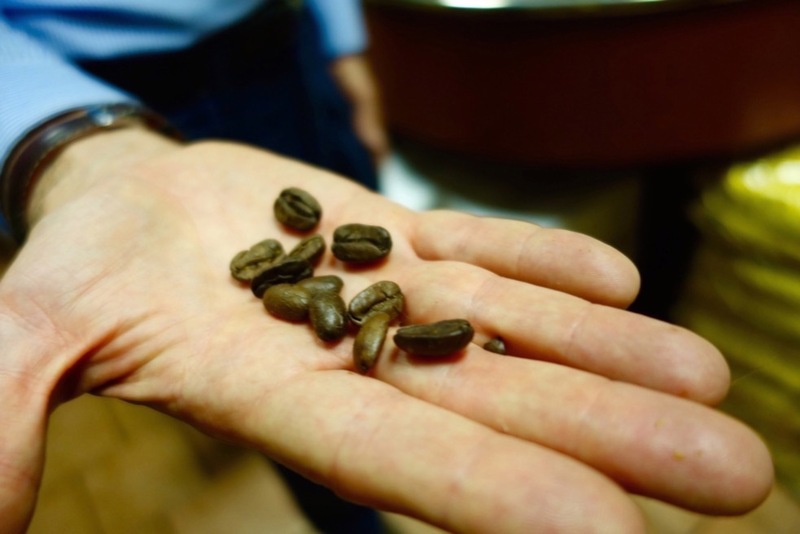 Raimondo Ricci, who owns Cafe Sant Eustachio with his brother Roberto, meets us to personally explain about the coffee industry and the journey of a bean – from a seedling to that creamy necessity you have everyday. 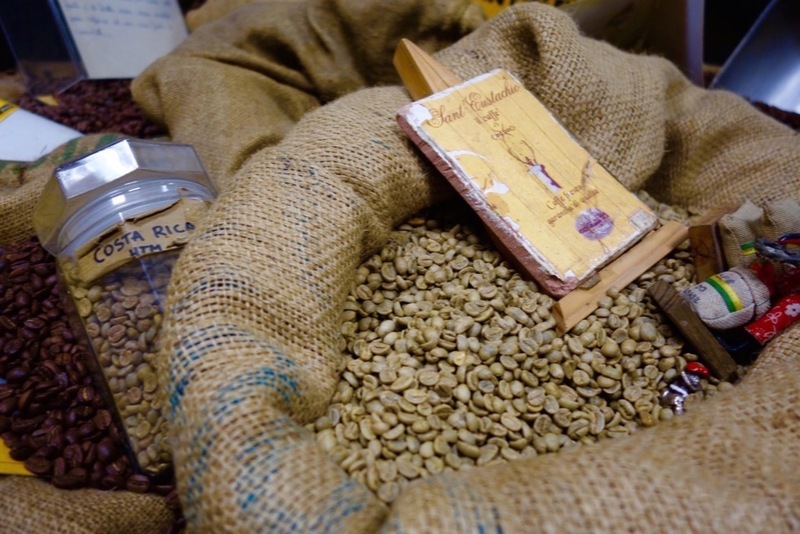 I learned that Brazil is the biggest importer of coffee beans, and that coffee beans are actually the pits of berries (who knew??). We were then given samples of chocolate-covered coffee beans, which were amazing as the sweetness of the chocolate balances out the bitterness of the bean. And the bean has a texture like a semi-unpopped popcorn kernel. Then we were served shots of fresh, creamy and frothy cappuccino . The cappucino was really smooth and silky. A small shot really goes a long, long way. And over cappucino, Raimondo regaled us with amazing stories that went behind Caffe Sant Eustachio. When I asked him how he felt about Starbucks and did he think it was the McDonalds of the coffee industry? You know a businessman is gracious when he never speaks negative about a company whose direction and philosophy he does not believe in. While he personally won’t steer in the direction of Starbucks’ business (or even remotely close to it), he says that he admires the way they expanded. He let us in that the modern pioneers (coffee tycoons) of the industry actually were in some way influenced by Caffe Sant Eustachio. In the early 90’s, a foreigner came to Cafe Sant Eustachio and he noticed that coffee for Italians are almost a sacred part of everyday lives. They actually stop and take the time to drink their coffee. So the cafe was a place for people to actually sit down, read something while taking their coffee. Unlike in then-America (90’s) when people grabbed coffee on the way somewhere, and sip it while driving or walking. This man, who turns out to be the owner of Starbucks, then went back to America and decided to turn Starbucks more into a “hub” where people can actually stay on longer and enjoy their coffee. Though probably not quite the answer the man was looking for, those 4 words soon became the inspiration for what the gentleman would eventually invent: Nespresso. 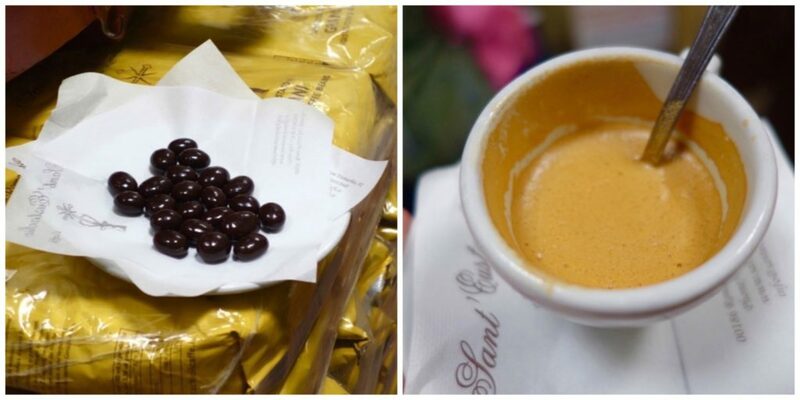 Caffe Sant Eustachio has been around since 1938 in the very same humble location. When asked if they had plans of expanding or opening franchises worldwide, Raimondo very firmly said they are not interested. They always get asked, as you can imagine but the extent of their expansion only goes as far as selling their packed products in certain coffee shops worldwide. 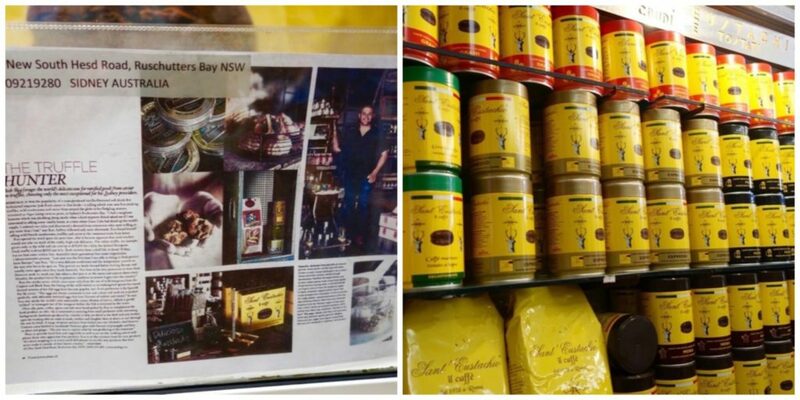 In Australia, you can get Sant Eustachio coffee in Rushcutters bay (above). 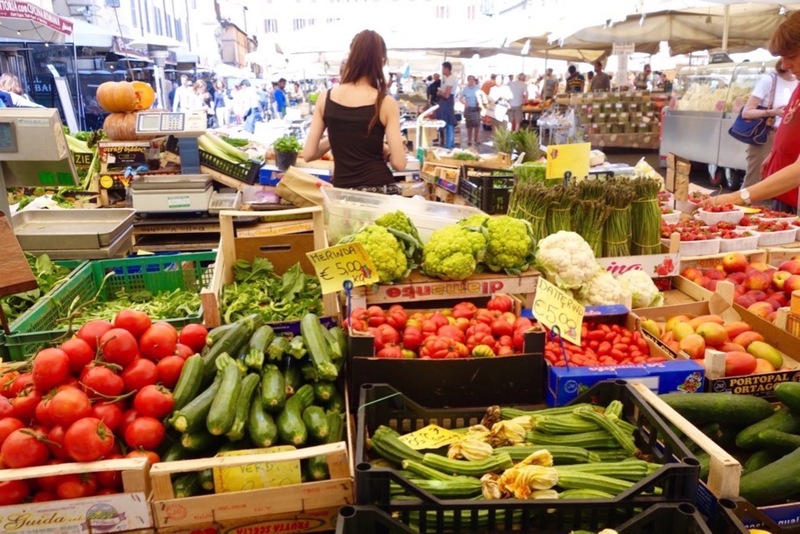 After starting our day with coffee (as most Italians do), we headed to Campo de Fiori , an open market by day and a place to hang out and dine by night. Campo de Fiori in English means “Field of Flowers”. It used to be a meadow back in the medieval ages. 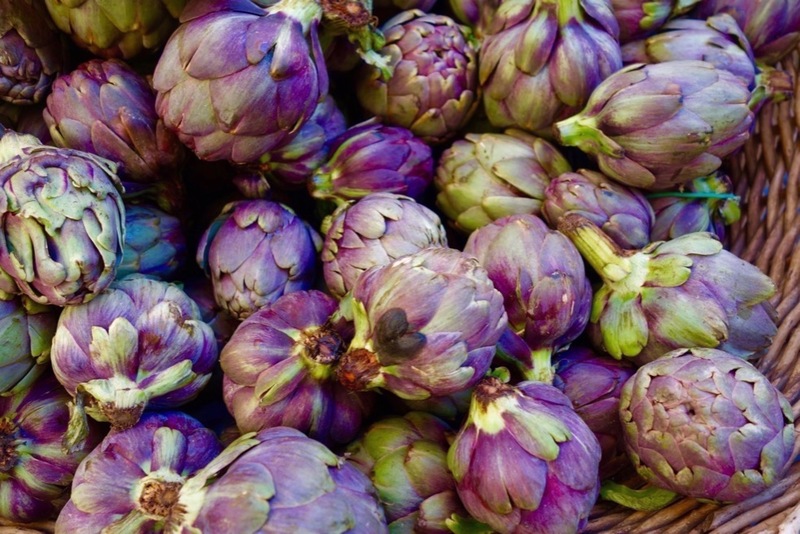 And even though the only flowers you’ll see nowadays at Campo de Fiori are the artichoke kind, it is still called as such. 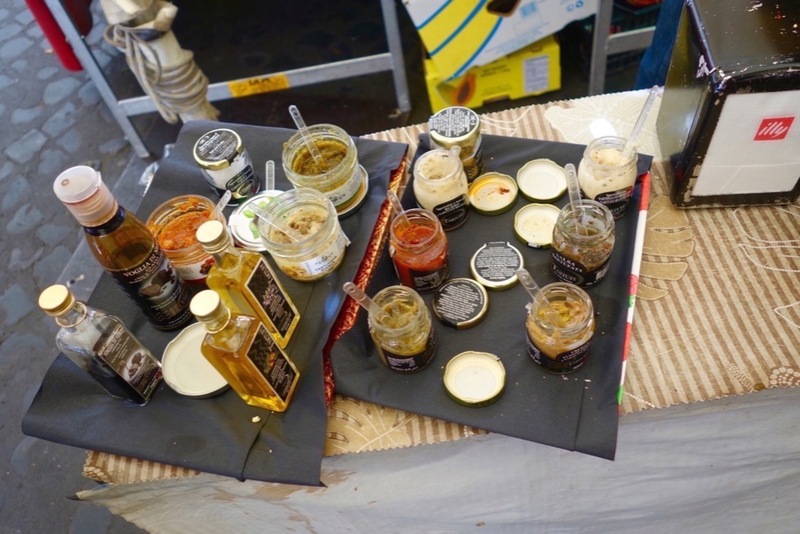 We then moved to a local truffle maker and we were given crackers and had a tasting of each truffle variety. The white truffle stands out the best for me. After our ‘starters’ of truffle and crackers, we headed to Antica Norcineria Viola. 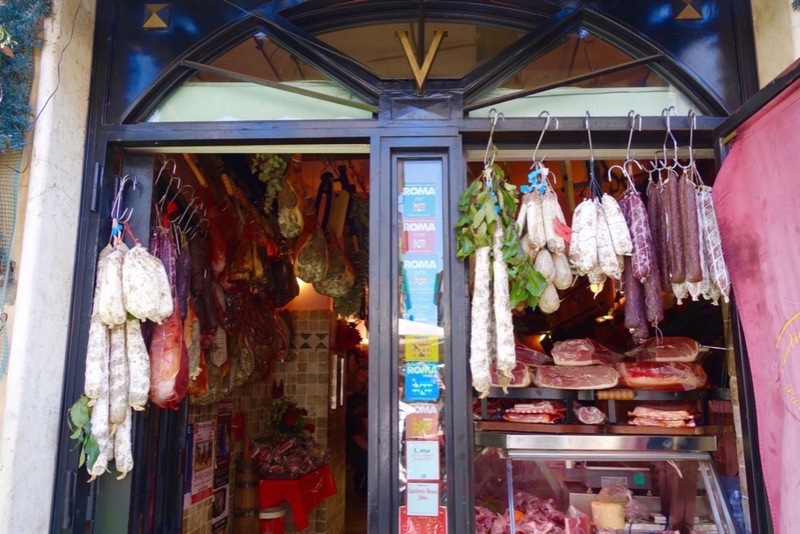 This store of salami and other cured meats has been around for more than a century, and is a family-owned business. The business owner Paolo took us inside his shop and had a platter of cured meats (salami, prosciutto, pancetta, etc) and cured in different varieties- with red wine, one with black or white pepper, one with liver, etc. There was also a bottle of wine to accompany all the samples. And then we get a mini break from eating and had a leisurely walk around the streets. It was such a perfect spring day, which we were fortunate to have as we were told it had been pouring during the days while we were cruising. But of course, we didn’t walk very far until we had another food stop. We stopped at Roscioli, a very popular deli / restaurant / bakery (all around, really!). During the day its a very busy and packed lunch place, with locals rushing to get their take-away lunch, usually slices of pizza. 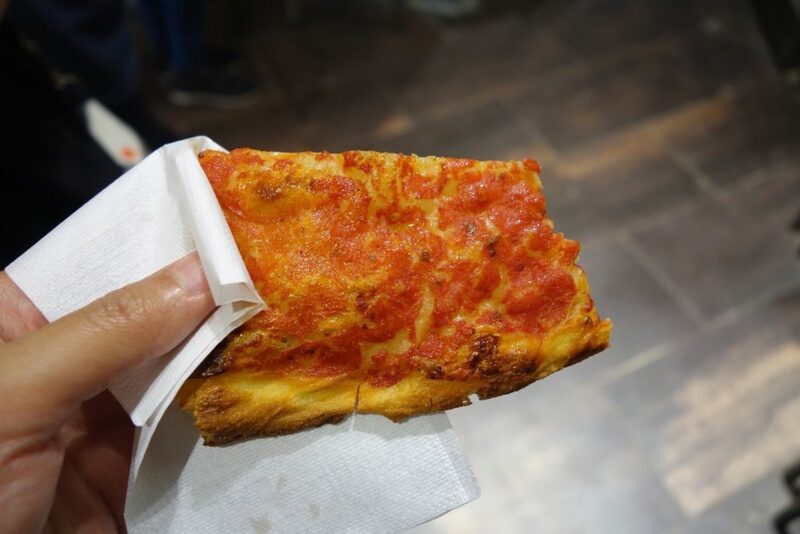 It is here that we tried the most basic pizza with just tomato sauce, and though it looks and seems incomplete, it can be a tasty meal in itself! And it was here that Rachele explained the main difference between a Roman pizza and a Napolitana pizza. Roman pizzas have crispier crusts and can normally be eaten by hand. Pizzas from Naples on the other hand, has an even thinner crust and the crust is softer, especially in the middle where the toppings almost pool around the pizza. 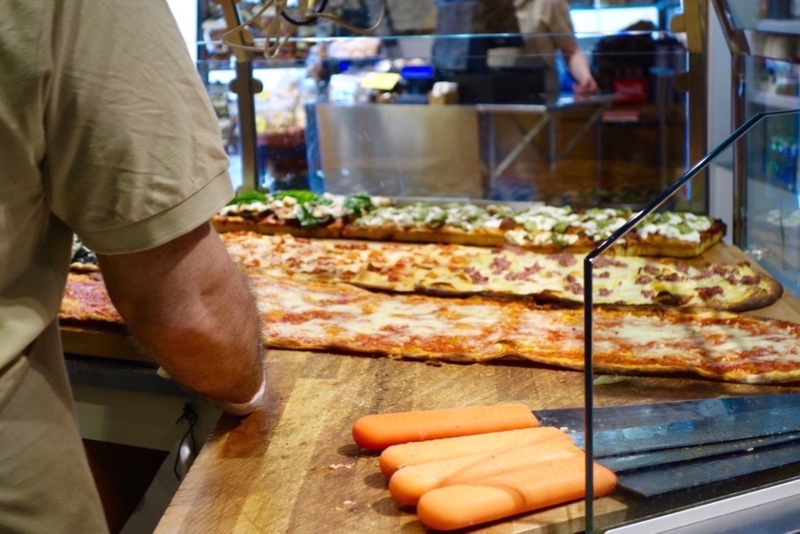 It is impossible to eat a Napolitana pizza by hand. Between the two, I prefer Napolitana pizza but I can see how the convenience of a Roman pizza comes in handy, especially if you are a busy Roman with a limited lunch break. 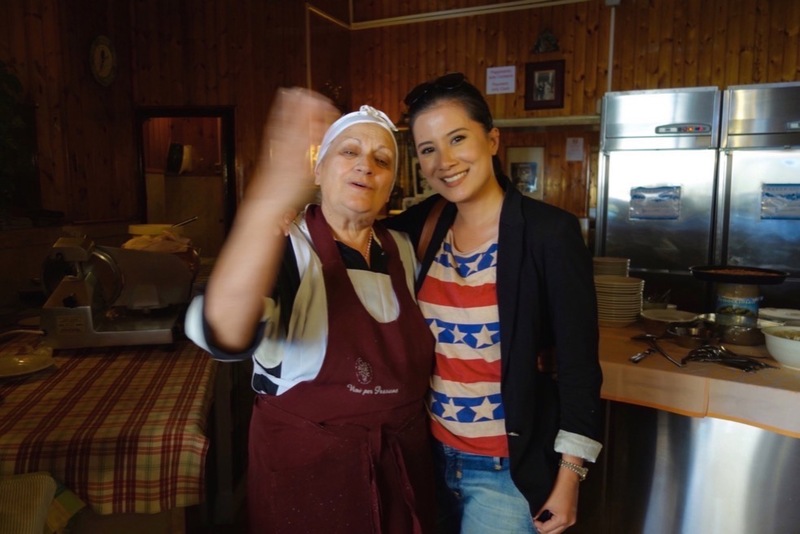 Trattoria der Pallaro is a very warm, cozy family style restaurant where the meals are lovingly prepared by Nonna Paola (above). And this was really something different from the usual Italian food that I know and have had in the past. Our lunch was simple but hearty. We had lentils (my those lentils were SO good!) 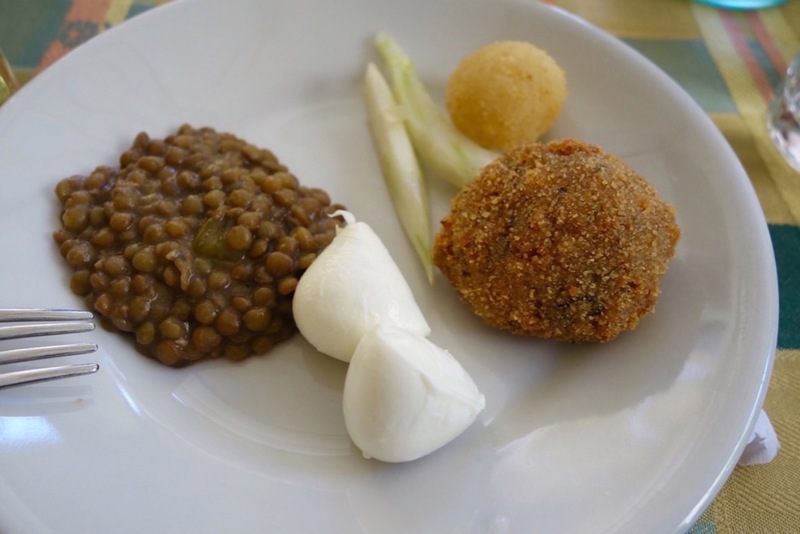 , mozarella, fennel, rice balls and 2 kinds of pasta (white and tomato-based). We were definitely fed with much love and I liked that I was able to get a taste of what a more typical meal is that Italians would have at home and not the usual Italian fare. 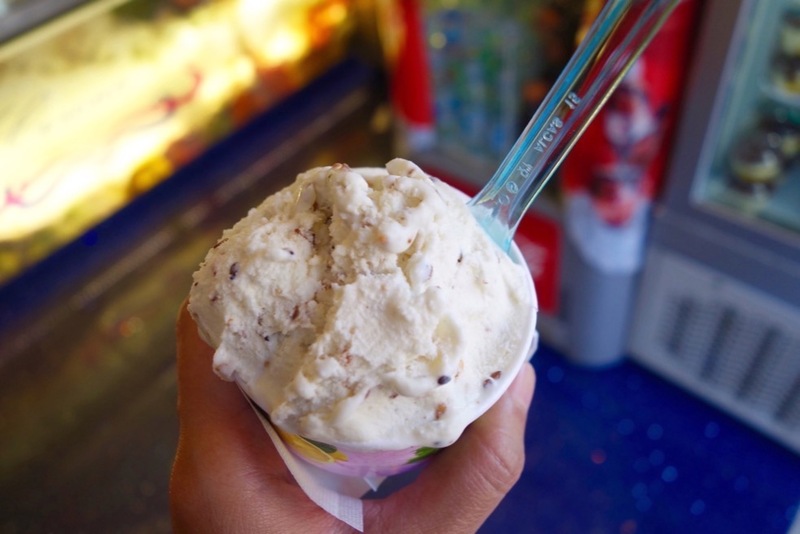 I opted for the sesame flavour and it was really great, creamier than your usual gelato. We finished the tour early in the afternoon (around 3-ish?) and I was really satisfied with it. I’m also extremely impressed that this kind of ‘almost-private’ tour is very affordable, considering ALL the food you get. Their advice was really on point that one should arrive hungry! 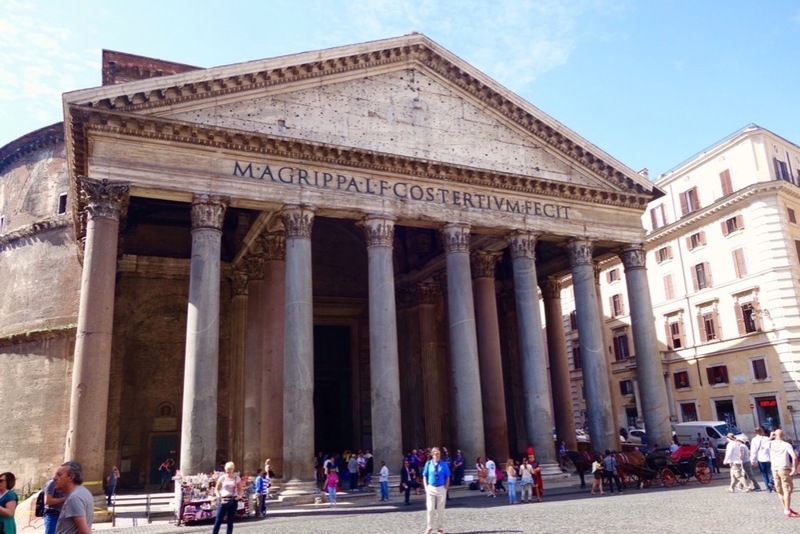 I would recommend The Roman Guy’s Food Tour, and would gladly go on it again. Rachele and Lorna are very knowledgeable, not to mention very approachable and friendly. What I really loved is that they really focus on guests getting the maximum enjoyment and have only a handful (well in our case, three!) guests in one tour. What’s your favourite Italian food? What do you think of food tours? We were guests of The Roman Guy for this tour, however all opinions, thoughts, and calories consumed are entirely mine. There is no obligation to project a favourable review. The Fresh Market Lunch Tour starts at USD 74.00 per adult (approx AU 94.00) and they have student and senior rates as well. I was supposed to have a tour with the Roman Guy when I was there but due to our poor planning we ended up missing. We did, by coincidence have a delicious lunch at Roscioli, the bread is incredible! i am sure i was amazing moment for you.because last December i went Rome with my uncle .so it was amazing moment for me .specially their food.thanks..
Oh you absolutely have to return, 12 hours is a tease! Indeed that was silly question to ask what your Italian favourite food is, even I cannot decide! But I chanced upon a simple pasta with just garlic and oil OMG it was soooo good! I’m so happy I stumbled across your blog. I had the great fortune of traveling to Italy for 2.5 weeks to visit my cousin in Naples when I was younger and I only wish I’d been a bit older and could have appreciated it more. I’d forgotten about the tastes and sounds of Rome and now have vague memories of the various locations we visited. I do remember the pizza controversy and how Naples claimed to have invented the pizza. And the gelato! Yumm. 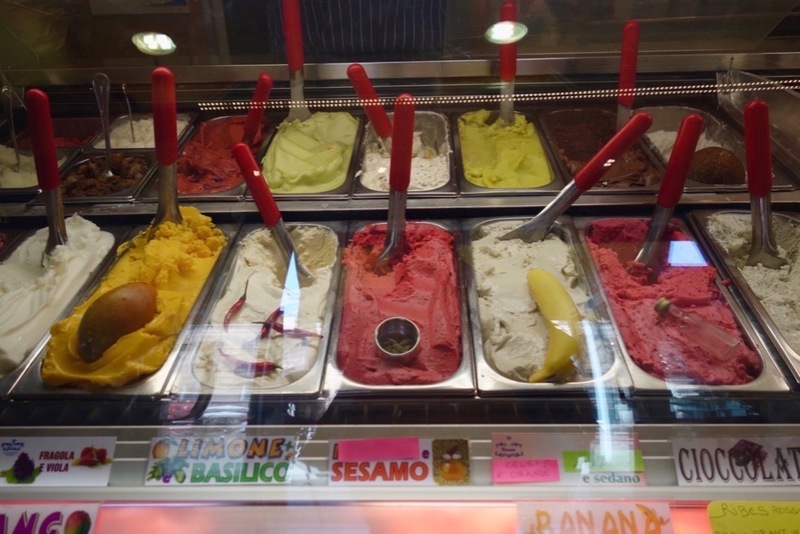 I still crave that gelato. I have to say, Positano was my favorite place out of every destination I saw, but even those picturesque streets have faded over time. 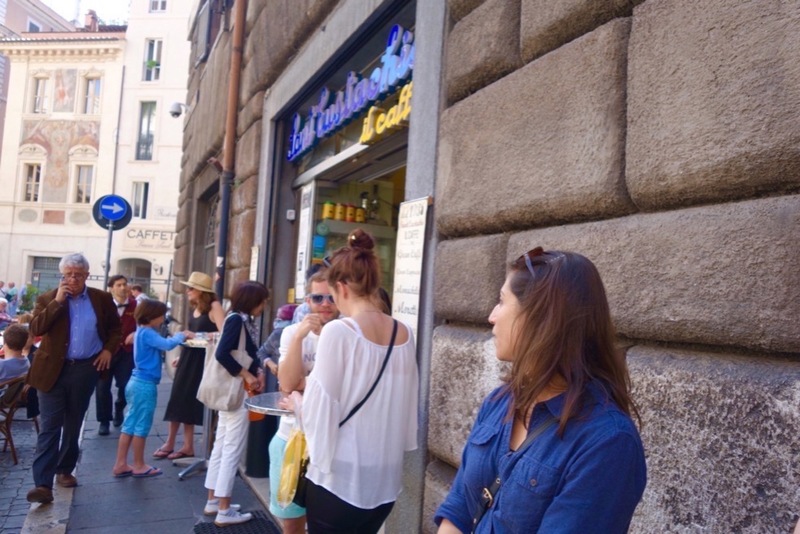 Forgive me as I have sinned – I’ve visited Italy many times and never done a walking food tour! I do fancy heading back to Rome for a tiny Roman Holiday and hopefully good gluten free food. A fantastic post. Really enjoyed reading this! I did a Driving and Walking Tour with The Roman Guy and it was incredible!